What was already an ugly day for emerging markets, turned even uglier for Brazil when Bloomberg reported that the head of Brazil's central bank, Ilan Goldfajn, was preparing to leave the central bank by year-end. 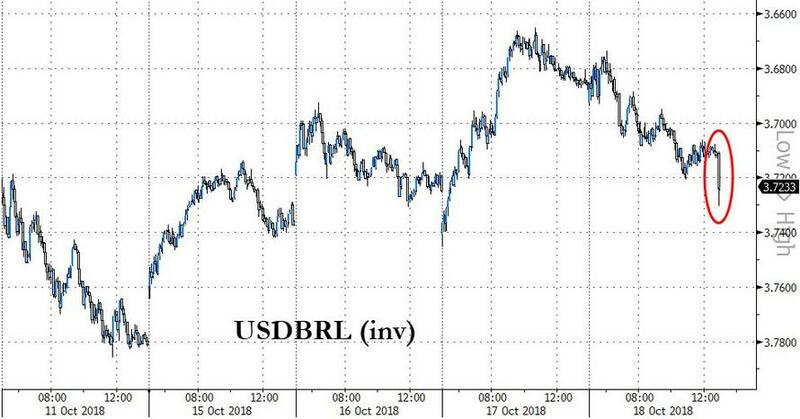 There was no reason cited for the departure of the relatively new central bank head, who was appointed to his current position in May 2016, however news of his departure shook the BRL, which tumbled to session lows against the dollar. Bloomberg adds that the campaign of presidential front-runner Jair Bolsonaro - who had initially considered keeping Goldfajn as central bank chief - was mulling several names as central bank chief. 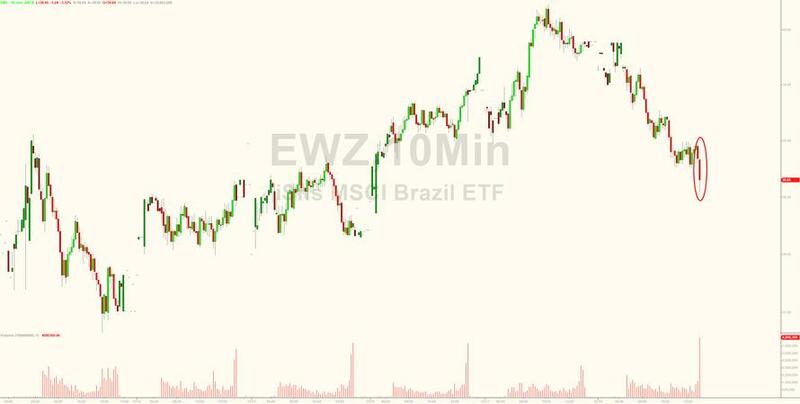 In addition to slamming the BRL, news of the departure also hit the iShares Brazil ETF, the EWZ, which slumped to session lows on the news as yet another legacy central banker quietly prepares to exit stage left. Even before the news, EMs suffered another bloodbath session, with almost every developing-nation currency falling, while MSCI’s EM stock gauge extended a two-day slump. Mexico’s peso dropped after Donald Trump threatened to summon the U.S. military to close the country’s southern border, while the Shanghai Composite Index slid to the lowest in almost four years and China’s onshore yuan fell for a fifth day after the PBOC surprised traders with an unexpectedly weak fixing.